The Oscar 1 is an Omni-directional wall / bracket mount antenna, operating on quad band GSM/GPRS and 3G frequencies. Ruggedly constructed with black ABS plastic over the radiating element and with a lightweight yet durable aluminium mounting bracket. The Oscar 1 is designed for outdoor use to improve cellular signal strength reception and transmission. Its high quality monopole design provides a peak gain of 3.5dBi within its operating frequencies for improved site communication. This antenna is installed with ease using a couple of screws to secure its inbuilt L bracket to the best position for optimum signal transmission. Common applications for the Oscar 1 include: base station purposes, remote monitoring, and alarm & security systems. The Oscar 1 is tuned to quad band GSM/GPRS & 3G/UMTS frequencies, making this antenna a very mainstream performer. 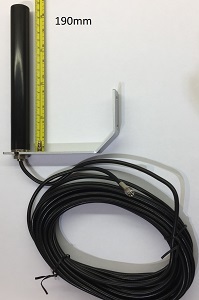 Its wide operating frequency band allows for worldwide cellular applications over the quad band GSM/GPRS networks and also high data transfer rates via 3G/UMTS, aided by a high peak gain of 3.5dBi.Supplied with 10 meters of RG58 cable to allow routing and maximum elevation to best optimise site communications. As standard, cables are terminated with either an SMA male or FME female connector type.